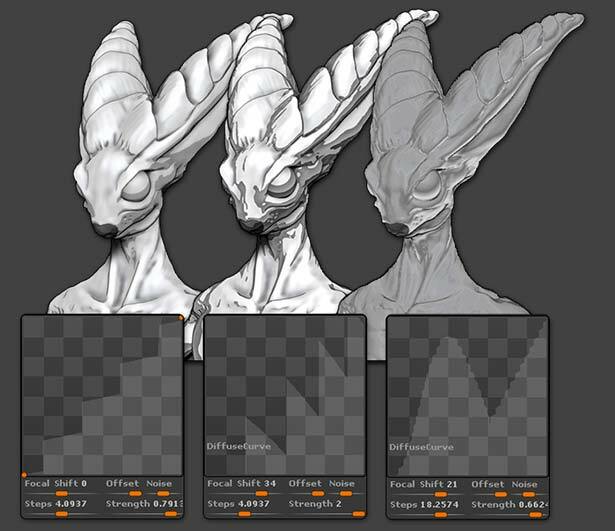 The first location where you can set posterization is with profile curves of ZBrush. 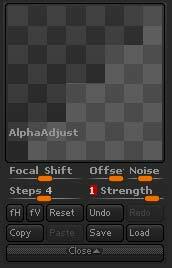 A couple of new settings have been added which will affect the curve shape: Steps and Strength. By increasing the Step value, you will create steps in your curve, breaking it into a number of steps defined by the slider’s value. Three different curves and their results. 1. Load a 3D model. 2. Select the Skin Shade 4 material from the Material palette (found in the Standard material group). 3. Open the Material palette and expand the Modifiers. 4. You should find a list of sliders and curves. Expand the Diffuse Curve. 5. Change the Strength value to 1 and set the Step value to 5. 6. Your model should now show distinct shading colors rather than smooth gradients. 7. You can also make changes to the Specular curve to alter your cell shading effect. 8. Hit the Shift+R shortcut to perform a BPR render and most clearly see your modifications. Note: If you have a low polygon mesh, posterization of the material can make the low model resolu­tion really visible. To get the best results, enable Smooth Normal mode in the Render > Render Properties sub-palette. This is just one example of posterization. As already mentioned, you will find the Step and Strength sliders in every ZBrush curve, letting you use the effect in a large number of ways.